Home » Blogs » Are Defense and Disasters Causing the Deficit Increase? Are Defense and Disasters Causing the Deficit Increase? When asked about the increasing deficit, President Trump yesterday pointed to defense spending increases and disaster relief. While both of those factors played a role, they are only about a quarter of the increase that Congress enacted last year. The largest single bill increasing the 2018 deficit was last year's tax cut bill – though other tax cuts and spending hikes also contributed. AP: You saw the numbers, the coverage in the last couple of days about deficits. That the projected deficit is a trillion dollars. You railed on President Obama over deficits. Trump: Excuse me. No. 1, I had to take care of our military. I had no choice but to do it, and I want to take care of our military. We had to do things that we had to do. And I’ve done them. Now we’re going to start bringing numbers down. We also have tremendous numbers with regard to hurricanes and fires and the tremendous forest fires all over. We had very big numbers, unexpectedly big numbers. California does a horrible job maintaining their forests. They’re going to have to start doing a better job or we’re not going to be paying them. They are doing a horrible job of maintaining what they have. And we had big numbers on tremendous numbers with the forest fires and obviously the hurricanes. We got hit in Texas, Florida, Puerto Rico, Georgia. Georgia was hit very hard this time. Nobody even, you know, treats that one fairly. The farmers got hit very, very hard. The Treasury recently announced the final deficit for the fiscal year that just ended (FY 2018): $779 billion, up from $666 billion the year before. We recently calculated that over one-third of the 2018 deficit and 234 percent of the increase in deficits – $264 billion – was due to legislation enacted by Congress over the past year. The largest portion was the tax law, estimated to cost $164 billion in FY 2018, followed by the Bipartisan Budget Act of 2018 (BBA18) which was estimated to cost $68 billion in 2018. (Although the spending deal increased the budget caps by roughly $150 billion halfway through the fiscal year, not all of the increased allocation is spent in the first year.) 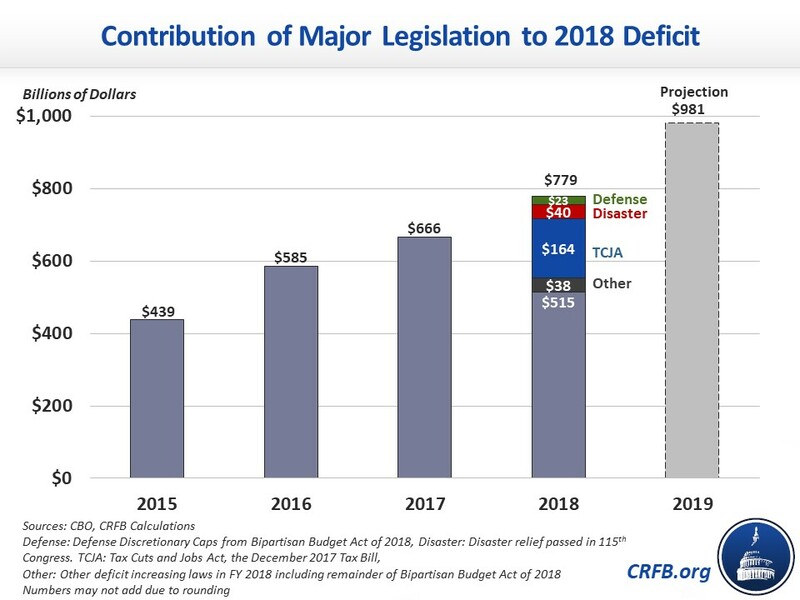 Other legislation added $32 billion to the 2018 deficit, mostly for disaster relief legislation. So how much of the 2018 deficit increase was because of increased defense spending and disasters? BBA18 contained increases in defense spending, increases in non-defense spending, disaster relief spending, and tax cuts targeted at disaster relief. We estimate that about $23 billion of the $68 billion in outlays was spent on defense increases. In total, about $40 billion was spent on disaster relief, including the money in BBA18 and three other disaster bills. As a result, increases in defense spending and disasters are responsible for 9 and 15 percent, respectively, of the deficit increase enacted by Congress, respectively. 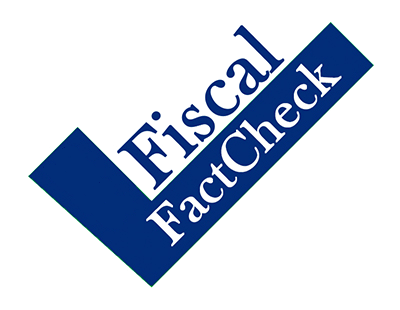 Both the tax cuts and spending increases enacted last year increased the deficit. While defense spending and disaster relief was a portion of that spending, it was not the main driver of the deficit increase.